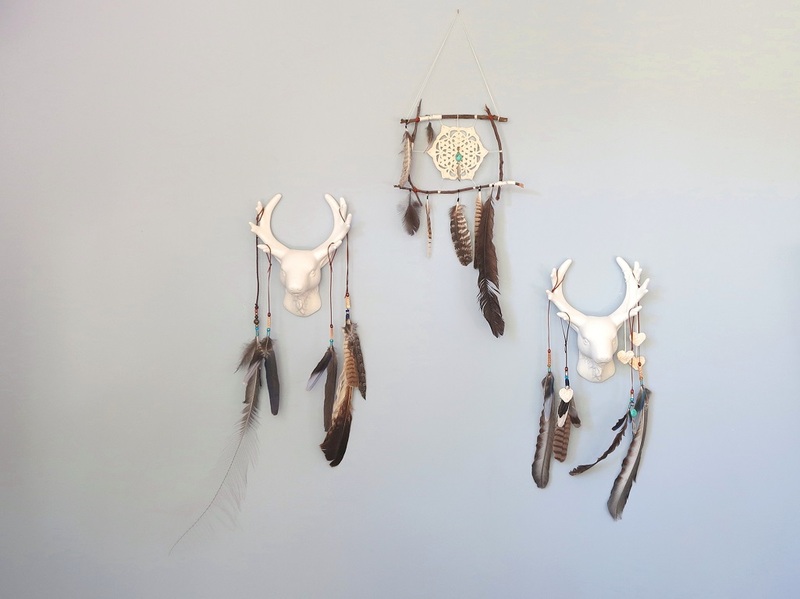 Deer Antlers loved up with handmade goodness, nature and peace. 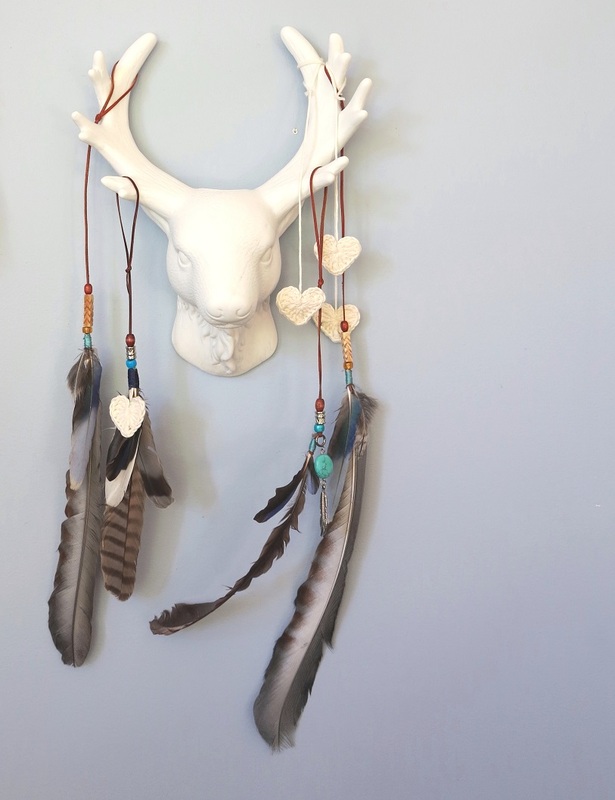 This one is mine… A little leather, beads, feathers, turquoise and of course some crocheted hearts. Hubby made the feather drops using some vintage aqua silk thread to bind them up. 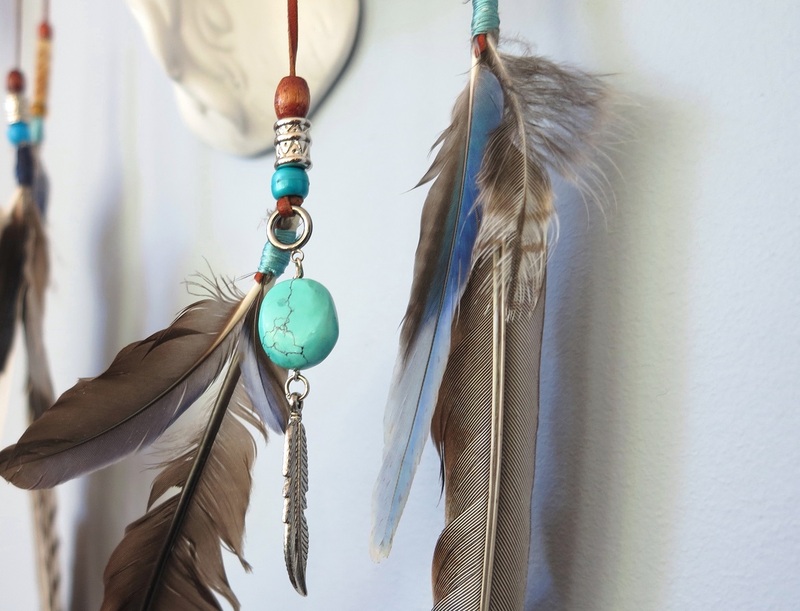 I selected the feathers and placed the turquoise drop and crochet heart in position, and he patiently tied them all together. He finished them with a little sliding knot on the leather so we can adjust the drop length when hanging them. I have Lyrebird feathers, Owl down, Rosella, Kookaburra and I think there’s a Currawong feather there too. All collected on walks I talked about in catching peace. This one is hubby’s… He has the treasured Lyrebird tail feather that he finally found after years of searching through twigs and leaves. He’s also got a very special Wedge-tailed Eagle feather in there. One day he saw a couple of them having a spat and as they flew off, one lost a feather. There’s also an Owl feather, some Owl down, Kookaburra and Rosella feathers. The leather plaited drop on the left with a rose bead is from our wedding day. 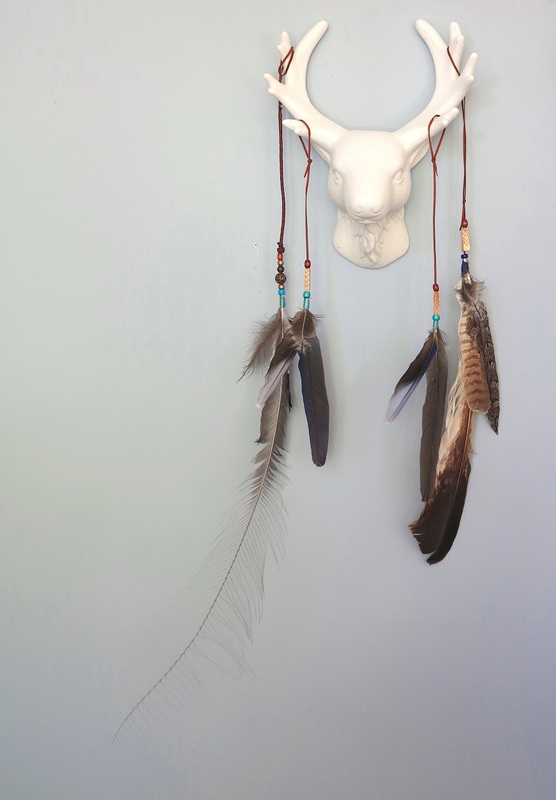 We loved putting together the eclectic mix of goodies on our antlers. It was a real combined crafty effort, mostly my design and direction with hubby selecting the feathers and making the drops. Real patience is required for the fiddly feather drops and that’s definitely his crafty talent more than mine. The turquoise and silver feather drop has been recycled from my blue suede bag. There were two of these but they fell off a couple of times and I was scared I would loose them. Being rather special and large pieces of natural turquoise I took them off the bag – they had been waiting for a rightful home for some time. 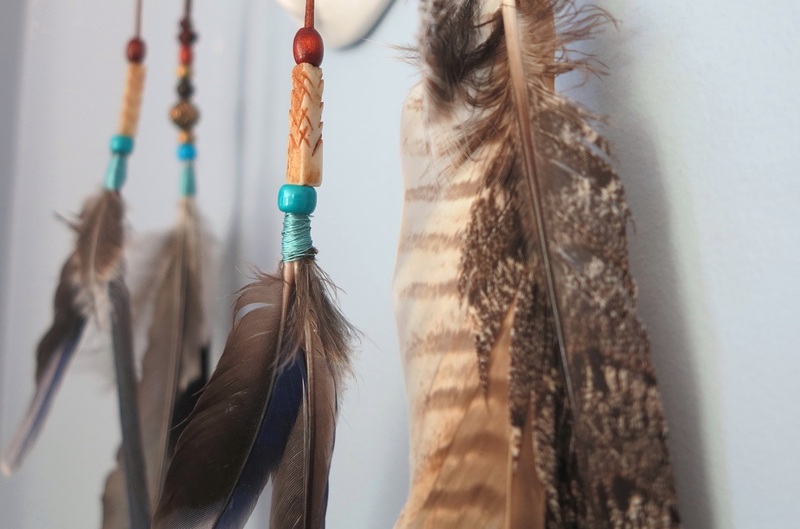 One found home in the feather drop, and the other one made home not so long ago in the center of the peace catcher. Somehow, I think they have ended up where they always should have been. There’s something special about this little collection of goodies that we crafted together…I find it very calming and peaceful and interesting to look at. 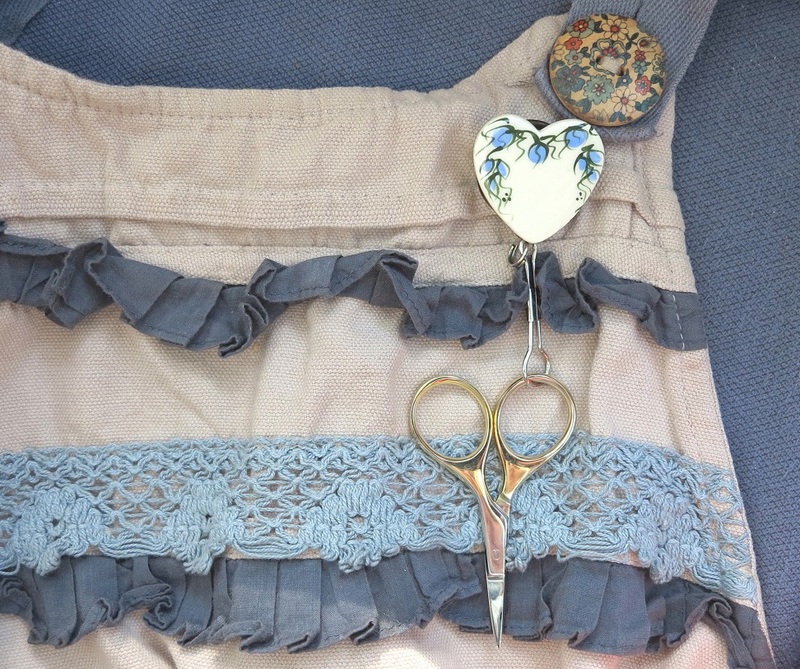 I have also been crafting in my usual space too… Remember this one? It’s been around for a while now and has a long and troublesome past. Well I decided I am going to finish this little number. 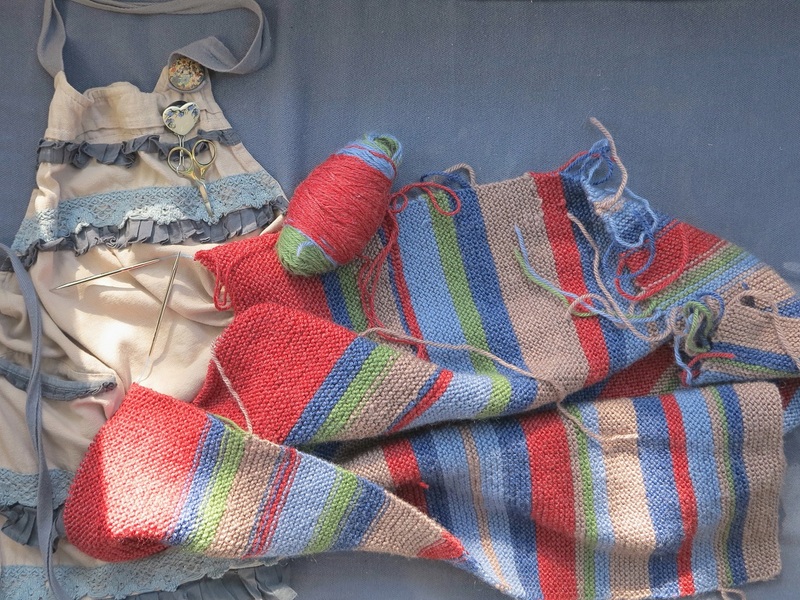 The yarn is all from Bendigo Woollen Mills and it’s such a delightful squishy blanket. Can you spot the mistake? I absentmindedly changed colours on the wrong side! But you know what? 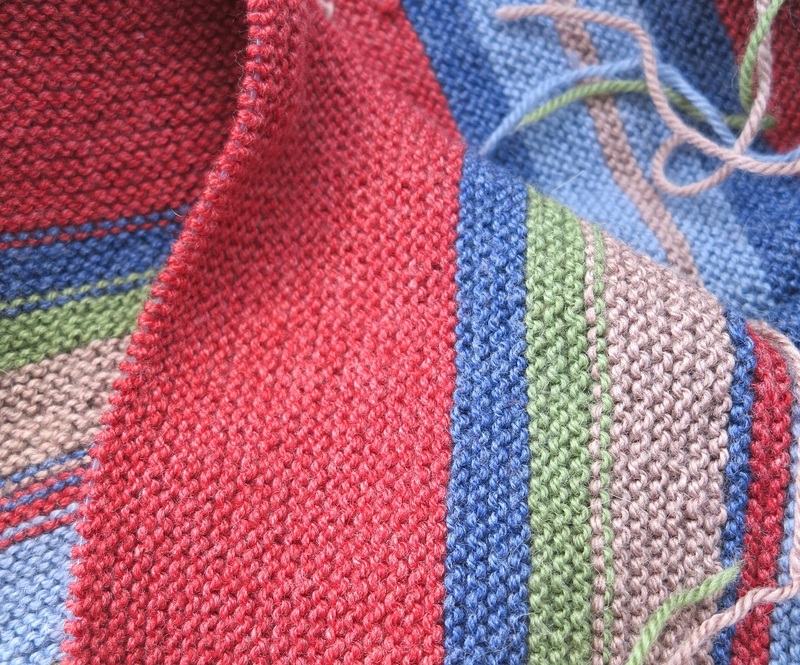 After the unraveling this blanket already had, and the time it takes to knit just one row (of a gazzillion stitches), AND after reading this brilliant post, I decided perfection was just too high a price to pay. 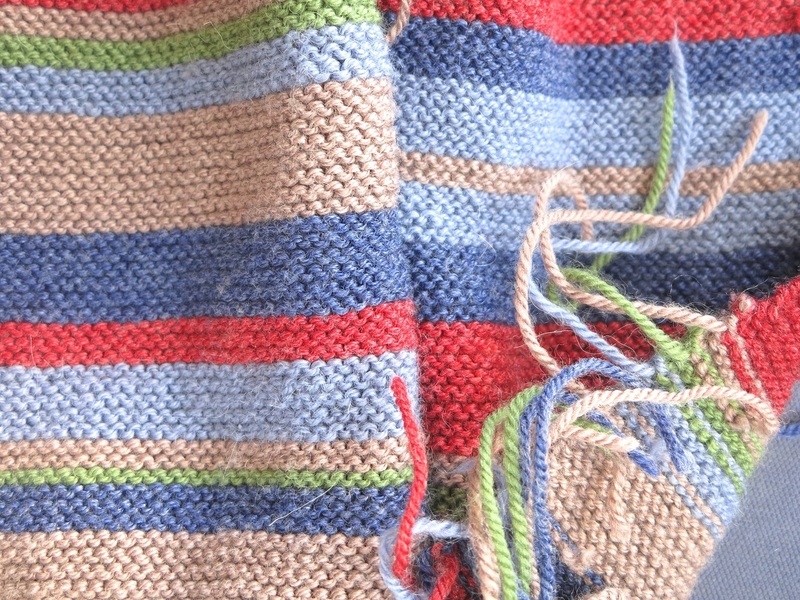 It still looks beautiful, but it really looks handmade – complete with human error… No machine could do that! Motivated by Felecia’s word ‘completionism’ I decided to push on and accept the imperfections of my work. If you like everything to be just perfect, then I highly recommend reading this great post to help see it all in a fresh light. This entry was posted in craft, crochet, knit, Photography, Stockman Leathercraft, Uncategorized and tagged 100% cotton, antlers, crochet, feathers, heart, hearts, inspiration, knit, knitting, peace, photography, silk, turquoise, wool. Bookmark the permalink. 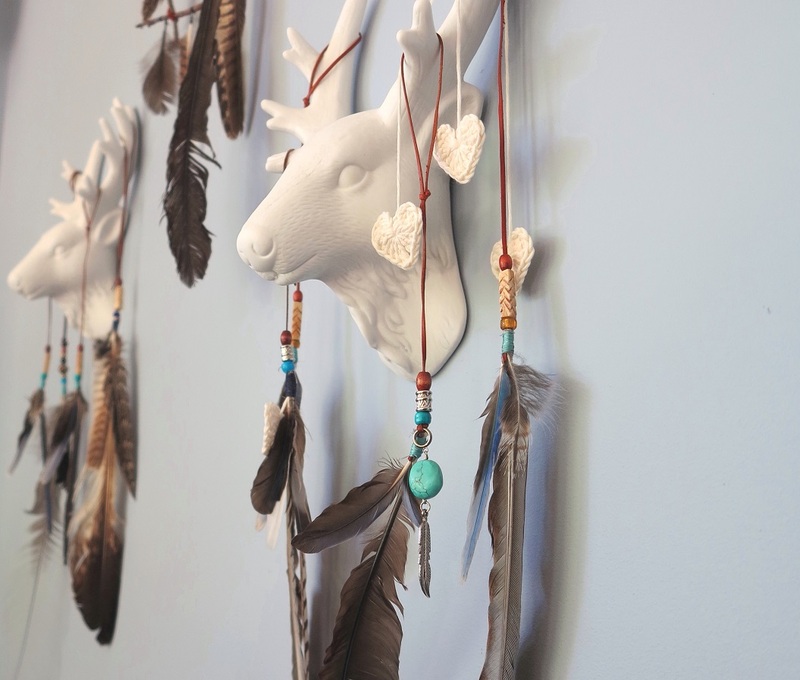 Loving the latest antler decorations!